LiveWell for LIFE was delighted to be one of only 12 exhibitors at the upcoming European Resource Forum (ERF). This conference took place in Berlin, Germany 10-11 November 2014, and was an opportunity for us to meet with some 400 delegates to discuss sustainable resource use. Worldwide population and economic growth are putting increasing pressure on resources such as raw materials, land, and biodiversity. ERF brings together European decision-makers and experts from the fields of policy development, industry, academia, civil society and the media, to discuss the sustainable use of these resources. 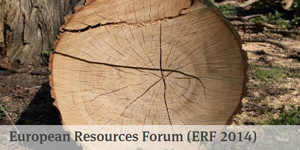 The ERF focused on resource use and the role of the financial system, justice in the use of natural resources and objectives for sustainable resource use. The ERF was held in the context of the European Commission’s 2011 Road Map to a Resource Efficient Europe and relevant follow-up processes. It aimed to contribute to a common position for which to build European and international policy for sustainable resource use. The ERF was an important instrument for communication on resource issues and for setting up networks and initiating stakeholder alliances at European level. The ERF takes place biennially and is hosted by the German Federal Environment Agency. In 2014 it was followed by the Federal Environment Agency second National Resources Forum, which took place on 12 November 2014.